Oooooooo... 2013 Roll. I'm jelly. Get me FB Likes. Share the post make it happen. push it hard. If my office wins then the BS member that can confirm the most folks he/she directed to "vote" will get a free 1/10th gold eagle. A tie will result in 2 free eagles I want this folks. Voting closes at Midnight eastern. We win by 10 votes and I'll include a Rodebaugh 1st pour. Get to it everyone....help ol' doc out. I dont care what it takes....we gotta win! I don’t know how this FB stuff works but will give it a shot. How do you confirm the number of people you directed to vote? bigjohn wrote: I don’t know how this FB stuff works but will give it a shot. How do you confirm the number of people you directed to vote? 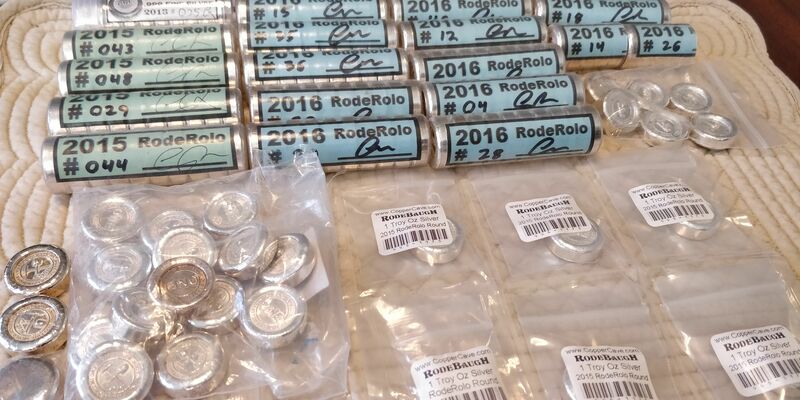 I hope your team wins Doc but, jeez when I saw the Rodebaugh Silver -got it- post, I thought you were announcing the future release of the rolos. Talk about getting my hopes up and here I am finally on your list with ants in my pants. ~sigh~ You are such a tease. Brick's wrote: I hope your team wins Doc but, jeez when I saw the Rodebaugh Silver -got it- post, I thought you were announcing the future release of the rolos. Talk about getting my hopes up and here I am finally on your list with ants in my pants. ~sigh~ You are such a tease. They are made.....just need stamped. It looks to me that Dorian might be the guy I need to get in contact with. It looks like he did about 70 votes for me. If anyone sees it different let me know and I'll take another look. I'm wore out. Thanks all for the help. Rodebaugh wrote: It looks to me that Dorian might be the guy I need to get in contact with. It looks like he did about 70 votes for me. If anyone sees it different let me know and I'll take another look. I'm wore out. Thanks all for the help. Nice work, Dorian. I think I got like 7. Haha. Glad to see the BS effort pushed you over the top. Note to self: expect to be poor Wednesday to Friday-ish. Stop by Costco for bulk ramen. Are these going to be available to new purchasers? I am interested.